Fractals, Those Endlessly Intricate Shapes with self similar structure all the way down as far as the eye can see. Fractals are changing the way we think about complexity in the natural world. Fractals in turbulence and complex systems all the way up and down the thermometer of complexity (not just chaos). Earthquakes, stock market flucuations, traffic on the internet illuminated by fractal statistics. Figtree fractal in orbit diagram. Each small part of the structure resembles the whole. Periodic window had a little homunculus (embryo)... going all the way down to infinity. From a given state only ONE past and ONE future. Where the two surfaces look like they meet it is only a close encounter. ​Why does chaos go hand in hand with the infinitely layered structure we see in strange attractors and fractals. The thing that causes fractals also causes chaos, two sides of the same coin. Dough is analogous to state space in the sense that dough is made of billions of flour particles as state space is made of billions of state. State Space - used to understand differential equations. State - all the information you need to predict what will happen in the next instant using the laws of motion, the differential equations. If I tell you the state (position, velocity), I can predict the position and velocity forever. What does a differential equation do to the dough. It takes states and moves it to successor state. A particle of flower and has to move to a new location. Kneeding it, stretching it and folding it. Dough ---> flatten and stretch it (rolling pin) ---> folds the dough into horseshoe ---> re-inject and then flatten and stretch some more. Iterated map. Rolling stretches the dough.. this causes chaos... two pieces of dough close together get spread apart... Initial conditions get spread apart and lead to two totally different trajectories. Blob of butter.. (is like nearby states)... flattening and folding and doing the process spreads the butter all over the state space uniformly on strange attractor. Mixing is CHAOS. Blob that starts as a concentrated thing, got sheared and spread all over. You end up anywhere on the strange attractor and you cannot predict the fate. Butter and Butterfly. Infinitely layered structured and fractals. Proved rigorous theorems about chaos. Lorenz - 3 equations with non-linear terms. 3 differential equations, 2 non-linearity. One wing of lorenz attractor in chemical experiment. Self-similarity is a kind of symmetry... It is a symmetry under magnification. Space pieces can be magnified to look like the whole. Infinitely many sheets in the Lorenz attractor. Where does the spec goe, where does the blob of butter go. Hopping around chaotically.... out of that crazy popping forms a structure. It appears like a ghost out of the mist. Escher - Smaller and Smaller - interlocking lizards. Mountains and clouds to the own branching of your blood vessels. Where do Fractals exist Outside of Chaos Theory and state space. Non fractal shapes and processes. Circle - you blow up and it becomes a line. If it was a circular string... All the way down to molecular level. 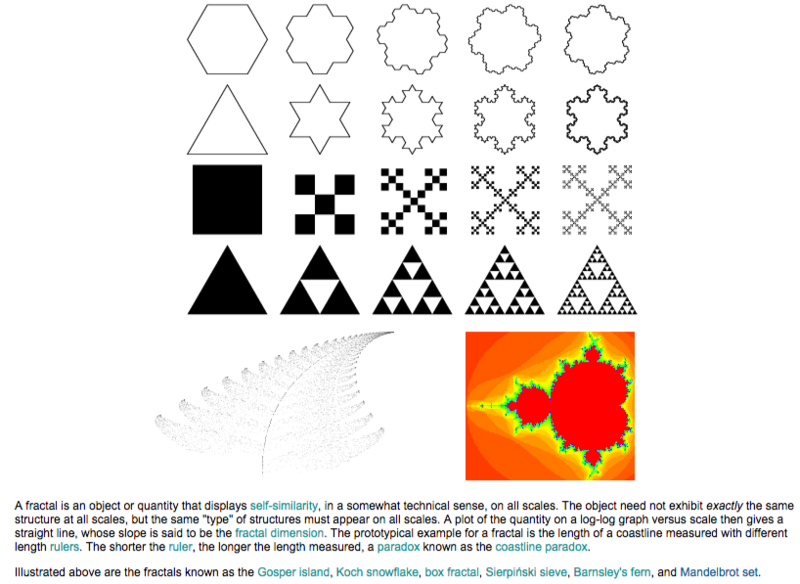 Idealized mathematical fractals vs Idealized Platonic shapes. 2) Small features resemble the larger one. Structure is archetechural the same at all levels. Real things not exhaustible.. Broccoli, 3 levels. The repitition of structure is not perfect. Similarity may not be perfect. Not perfect. Over what range of scales... 3 levels, 10 levels... fractal approximation. 2 orders of magnitude usually in Nature (100times). Something that stays the same despite a change has a symmetry. Fractal has a symmetry of magnification or a scale symmetry. Something that stays the same despite a change in scale. In physics, a symmetry of a physical system is a physical or mathematical feature of the system (observed or intrinsic) that is preserved or remains unchanged under some transformation. A family of particular transformations may be continuous (such as rotation of a circle) or discrete (e.g., reflection of a bilaterally symmetric figure, or rotation of a regular polygon). You have to set the scale for a scale symmetry. Rock formations are often scale free. Stock - was it minute by minute, day, year, decade. Looks -- Need Scale Indicators. Trees, branches like main trunk. Frost on glass... main body splitting. They can be confusing to analyze. How can you analyze scale free structures. Surface area of a football field. 5000 yards easy answer. Leaves out blades of grass. Ants would have measured a larger surface. Two Scales - Human and ant scale. You have to give an answer relative to the resolution of measurement. Fractal Dimension is the correct way to quantify scale free structures. Scale of Norway coastline... From Satellite or from person walking on a beach. How many coordinates do I need is not the best way to calculate dimensional. m= # of small copies of self similar pieces. Take middle segment and replace by two segments to make equilateral triangle. Like a line it is infinitely thin... covers no area. Dimension of edge is higher than one dimension. Making line 4/3 as long. 4/3^r blows up to infinitely. Infinite amount of arc length.... Two points still infinitely far away. Much more than a line, but less than an area. Fractals are shapes with infinitely fine rich structure in which the small parts are just scaled down version of the original whole or at least in some way remininescene. ​Fractals are not just static forms in space but can be erratic processes in time. Non-Fractals (Statistics) - Normal Distribution. Non-fractal space has one scale... Classic normal curve (tests, heights of people, etc)...Bell Curve. Gaussian distribution, Normal distribution. Everything has same size around the mean. Height, IQ, SAT, GRE, blood pressure, measurement errors, weight, average sleep time, shoe size, ring finger size. Size of ball bearing. Income, Earthquakes, Stock market, Population cities, nodes on internet, word frequency, frequency family names, crater size on the moon, copies books sold, etc. Large events much rarer than smaller ones ..
#Events is related to the size. Power law is one of the key ideas in thinking about the statistics of fractals. Power law is the link between fractal shapes and fractal processes in time. Power laws very different... Extremely large outliers (events of whopping size) are still there, rare, but much less rare than a normal. These outliers can have a stunning and dramatic effect on a systems behavior. Bill Gates would change average income in room. Suppose worlds tallest man walks in, he would not change average height very much. Height... No people 50 feet tall... never even 10 feet. Incomes are not constrained... unconstrained income. Absence of a scale..
1987 Dow -- Dropped 22% in a single ... Drop of more than 20 standard deviation. Standard deviation is a measure of the width of a bell curve. Less than 1 in 10^50 ... Essentially impossible in lifetime of universe. Power law distributions are fractal. Random walk models are based on bell curve distributions. Internet traffic ... Thought same on phone network. How much can we talk. Voice is constrained. Voice communication, network engineering... bell curve. Internet any size file... unconstrained. Fractal Structure in internet traffic. Earthquakes, Tornados, floods, Hurricanes are better predicted by Fractal mathematics and power law distributions. Not exact where and when, but more rational way to protect ourselves and manage rish.